A Kiwi man decided to celebrate his 81st birthday by hopping the fence of a bull pin to save his Ford Ranger “ute” from Rex, the raging bull. 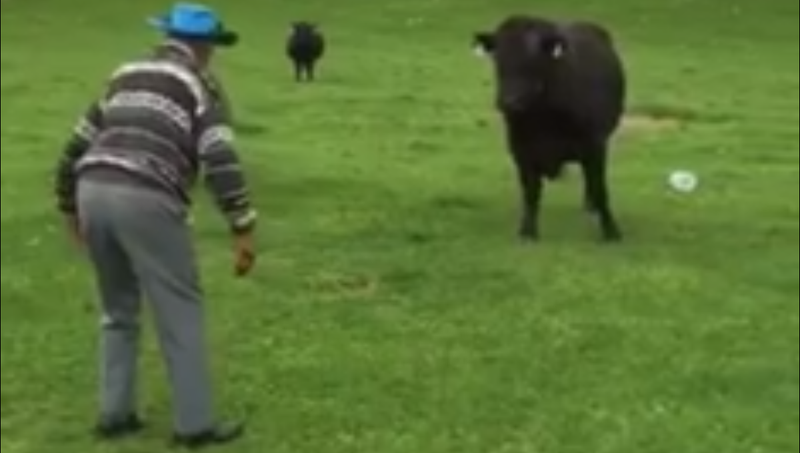 In the video uploaded to Whetu Konia’s Facebook page, Konia films his dad shooing off a bull that’s extremely interested in his truck, while continuously shouting at him to get back over the fence. The crazy old man throws both a water bottle and his blue cowboy hat at the pull and dances with it around the truck, culminating in a classic Western stare down. Son tries to shepherd dad trying to shepherd bull. It’s not crazy if it works, right? What Animal Deserves To Have A Car Named For It?